In a bit of offbeat news this afternoon, SilverStone has announced a set of thermal pads for M.2 SSDs, the SST-TP01-M.2. These pads are designed to eliminate (or at least reduce) throttling of modern, high-performance drives under high loads. The pads are made of silicone and Silverstone claims they can reduce temperature of SSDs by over 10°C. M.2 SSDs have a number of advantages over drives in traditional 2.5” form-factor: they are smaller, they are faster (because they use the PCIe interface with the NVMe protocol), they are (sometimes) cheaper to make, and so on. However, one of the main drawbacks of higher-end M.2 SSDs is the high heat dissipation of their controllers (and memory chips) despite their small form factor, which can lead to thermal throttling and reduced overall performance. Manufacturers have been aware of this for a bit now and have been addressing it in a couple of different ways. Plextor, for example, installs aluminum heat spreaders on their M8Pe drives, whereas Samsung’s latest HDDs come with other types of heat spreaders. However since not all SSD suppliers equip their products with sufficient cooling, SilverStone has developed an aftermarket thermal pad that should work with most drives. 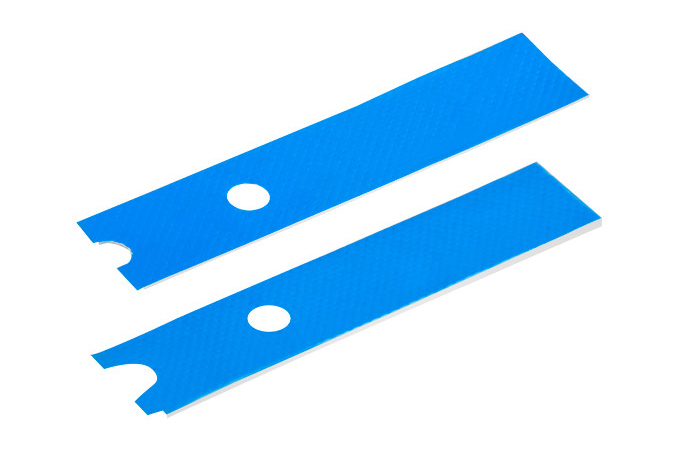 The SilverStone SST-TP01-M.2 thermal pads are made of electrically non-conductive silicone – a material that offers decent thermal conductivity (up to 4 W/m.k) – and can fit M.2 drives that are up to 110 mm long. 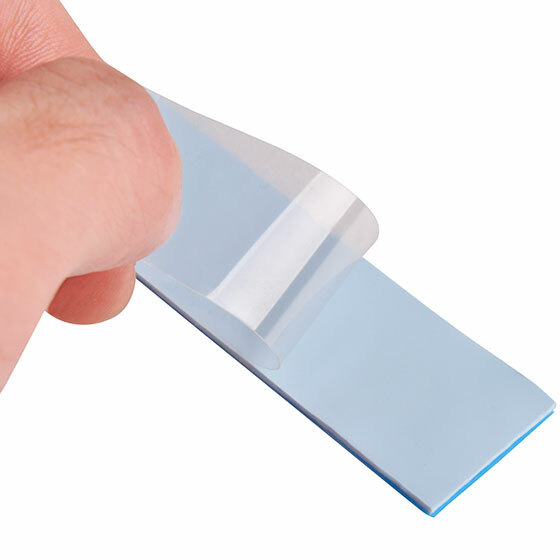 The SST-TP01-M.2 package includes both 0.5 mm and 1.5 mm thick pads for accommodating different setups. According to SilverStone, usage of the thermal pads can reduce temperature of Samsung’s SM951 SSDs from 86°C to 71.4°C under high loads, thus ensuring they operate at peak performance more often. The actual performance of SilverSone’s thermal pads will heavily depend on the SSD and the surrounding system – the heat still needs to go somewhere – but there's some potential here as silicone heatpads are by no means a new thing in PC hardware and have proven themselves to be useful. SilverStone has already started to produce its M.2 thermal pads, and in Japan stores in the famous Akihabara district are already demonstrating them. Unfortunately, pricing has not yet been announced. But M.2 SSD owners who suffer from thermal throttling of M.2 SSDs will want to keep an eye on this. The goal is to use the PCB as a heat sink. It is dumb, but it will have a tangible effect. I bet those pads will cost a ridiculous amount of money for what they are. Note that those pads are not adhesive, they are just pads. "This looks like it transfers heat to the PCB below, which is chock full of copper, and certainly much cooler." Are you sure that's going to fit between the usual places where M.2 SSD sits? By usual places, I mean between PCIe slots and back side of mobo. "I don't think you understand what a heat pipe is." Alright so this solution that Silverstone has come up with isn't going to work very well. Printed Circuit Board (PCB) has a very low thermal conductivity rate (k) of something like 0.30 W/m-K [Watts per meter-Kelvin]. Putting this silicon pad between the drive and the PCB will result in some heat being transferred from the drive to pad, however, once the heat energy is in the pad, that heat has no where to go. The PCB acts as an insulator. Yes, the PCB does have copper in it, but the majority of the material in PCB is FR-4 glass epoxy (glass fiber). So once the heat is in the pad, normally you would have air blowing over the pad to induce forced external convection with the air. Since, there's not a whole lot of air being moved relatively near this pad, you don't have forced convection, you now have natural convection. The rate of heat transfer between these two different modes of convective heat transfer is quite large. So now, what you have with this pad is closer to retaining the heat than getting rid of the heat. The solution is to move the pad to the top of the drive instead of between the drive and the PCB, so that the pad has access to more natural and forced convection. The rate of natural convection depends on the surface area that is exposed. If the pad is between these objects, the surface area exposed is just the thin sides, but if placed on top, the surface area is the entire top in addition the thin sides. In addition to placing the pad on top, placing a metal (aluminum/copper) finned block on top of the silicon pad would increase the heat transfer to the surrounding air. Fins increase the available surface area, which then increases the convective heat transfer rate.